Adds 3, 3, 3, 4, 4, or 4 to the team's roll. 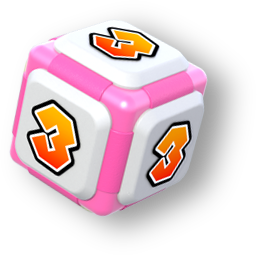 The Cutie Dice Block is Toadette's special, pink Dice Block from Mario Party: Star Rush. In Toad Scramble, when players have Toadette in the party, she can roll either a 3 or a 4 to add to the player's total roll. Compared to other character Dice Blocks, the Cutie Dice Block rolls from the pool of median numbers rather than from the extremes of high or low rolls. This page was last edited on February 26, 2019, at 23:10.